Tired of the same old pint of Guinness? Kick it up Leprechaun style! 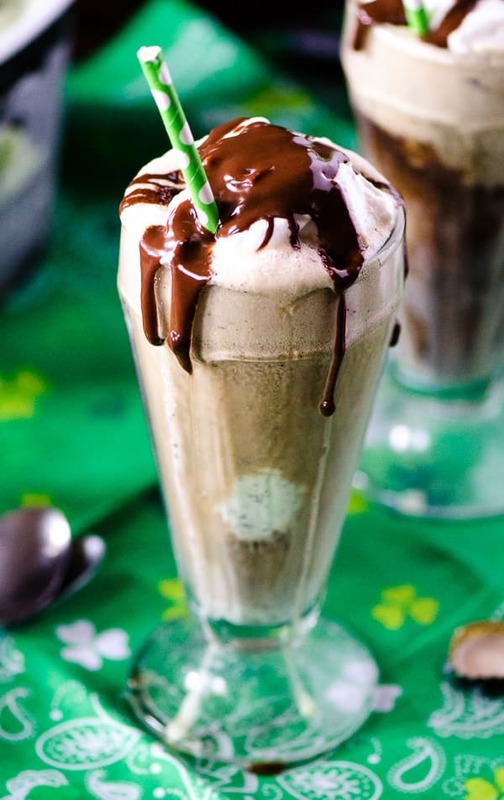 Add a scoop of mint chocolate chip ice cream, a dollop of Irish cream whipped cream, and a drizzle of chocolate for a fun and festive float. Life is hard. At the end of the day, after the work day ends, dinner and dishes are done, and the kids are in bed, it’s finally time for the grown-ups to unwind and relax. Sometimes, you just need a beer. Sometimes, it’s gotta be a Guinness. Sometimes….a plain ol’ Guinness just isn’t enough. 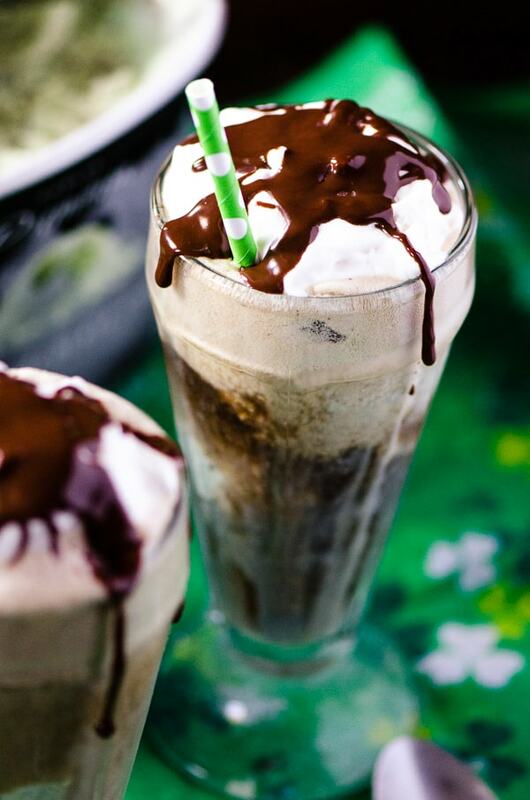 In which case, this Mint Chocolate Guinness Float is a perfect blend of childhood and adulthood, all in one glass! I admit, I was kind of skeptical of this concoction at first. 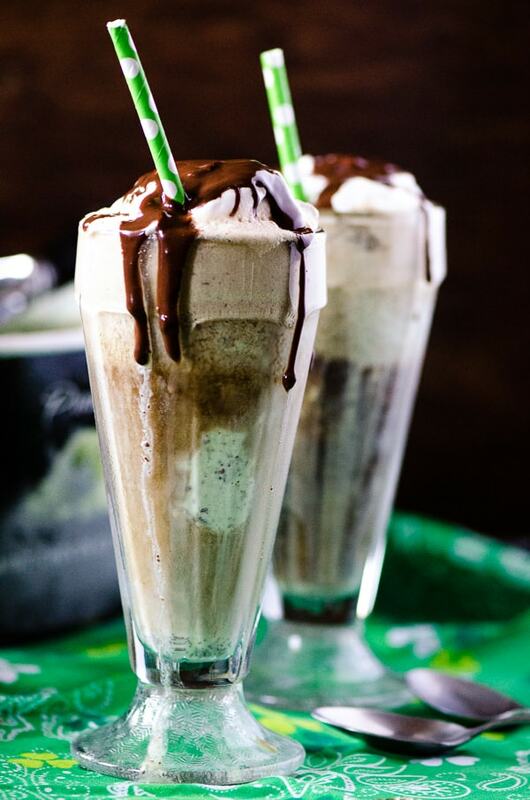 You can never go wrong blending mint and chocolate, and Guinness (stout beers in general) has chocolate notes that, by all accounts, should elevate the minty ice cream floating in it, right? SO right. 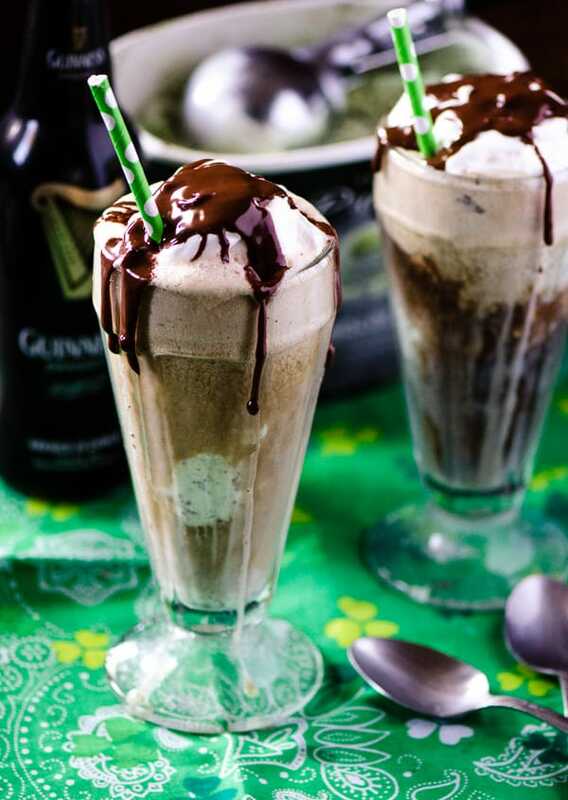 If you’re a Guinness fan and have a soft spot for minty green ice cream, then this float is for you! St. Patrick’s Day is right around the corner, so I offer this recipe for your celebratory consideration. It’s green and it’s beer and it’s Irish and it’s topped with a simple, tasty Bailey’s whipped cream that you might not be able to keep your spoon out of. I’m a sucker for whipped cream anyway, so if your whipped ratio is equal to your beer ratio, I promise not to judge. In a cold bowl, whip heavy cream to soft peaks with a hand mixer fitted with a whisk attachment. Sprinkle in sugar and Irish cream, then whip to medium peaks. Set aside. Place scoop of ice cream in a dessert or pilsner glass. Slowly pour the stout on top of the ice cream, allowing the foam to go down before adding more. Stir slightly. Top with Bailey’s whipped cream and garnish with lots of chocolate sauce. Enjoy!